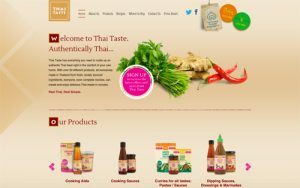 Thai Taste wanted to outsource to us with the aim to create a newsletter that reflected the website in order to keep the product branding consistent to create a sense of familiarity for the customer. 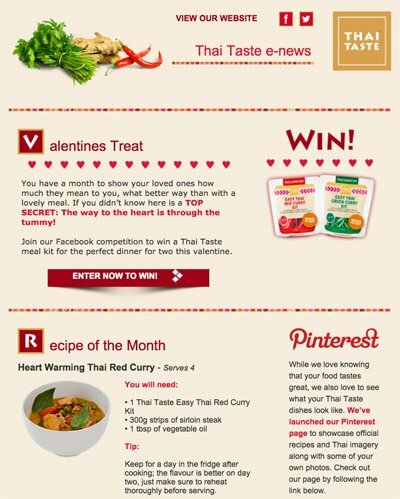 The objectives were clear they wanted to keep in contact with their client base to gain more engagement, loyalty and to inspire their client base on great Thai food dishes that they could cook themselves. After establishing an action plan, we began a monthly email campaign and optimised the design to enhance customer interaction and functionality. Built around the existing brand, we used HTML email design to keep the theme consistent with the website giving it a sense of familiarity. Each email contained details of a competition, a recipe and other news elements related to the company. As well as information of where their products could be purchased. Incorporating links that directly navigated to Thai Taste official website made it easy for the customer to browse the ranges. Altering the email design and content would increase repeat business and engagement. Through our constant monitoring, we were able to see the response from the targeted audience and we received positive feedback when analysing the data. Any changes that needed to be made to enhance conversion rates, were altered in order encourage clients returning. Tron Media helped Thai Taste meet all their goals with campaigns generally received a good open rate, with some campaigns receiving especially good click through rates. Let us review one of your existing email marketing templates and we’ll show ways that you can increase your open rates and click through rates and conversions.